Two challenges today, and two posts! 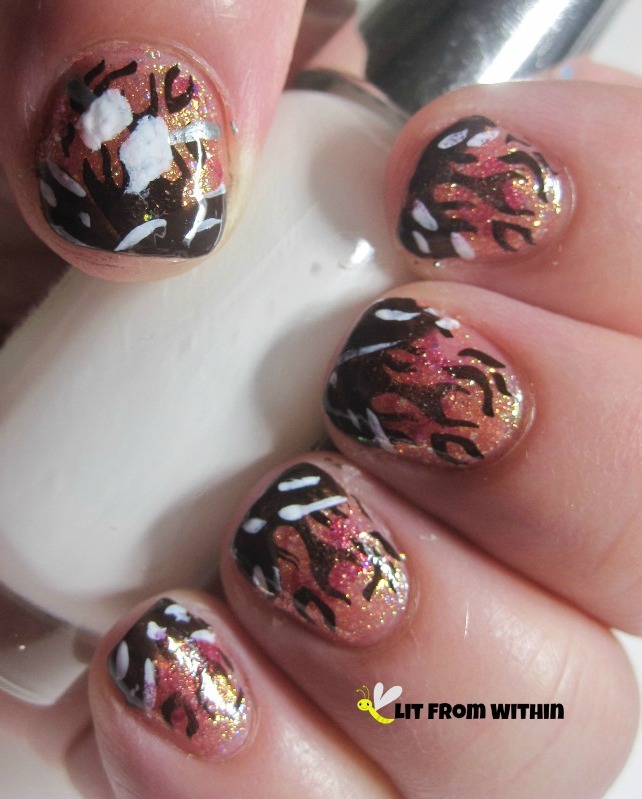 If you'd like to see my last Challenge Your Nail Art post with my campfire nailart, click HERE. Today's Sunday Stamping challenge was to stamp over a striped base. I've been loving all these metallic chromes and foils lately, and I just picked up two from the SephoraX line on clearance. This is Artic, an icy blue. 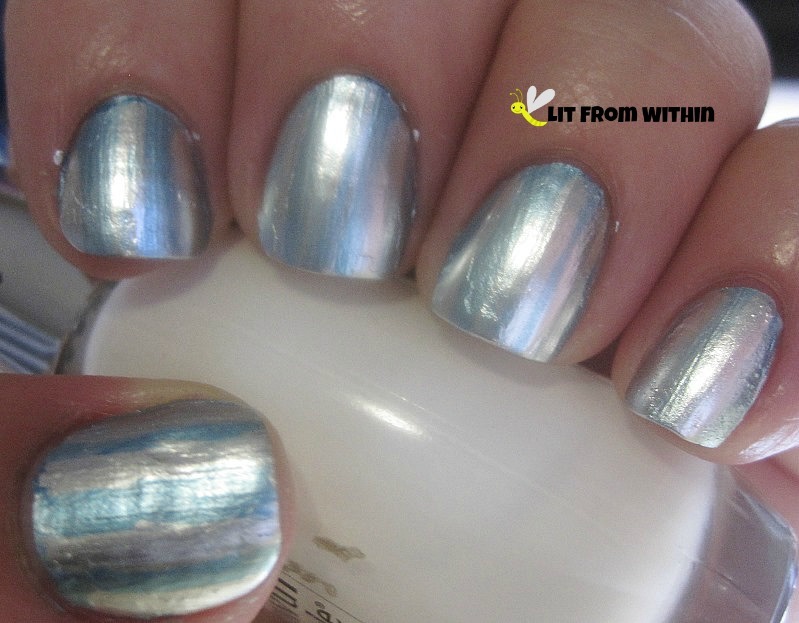 I took Glacier, which I thought was pink, but is actually silver, and made freehand stripes - just using the regular brush. In Real Life you could see these better, but the contrast isn't huge. Also, these polishes brought my camera to it's knees. It was begging me, no more! No more shiny! These polishes are ridiculously shiny. If it could be too shiny, it would be. 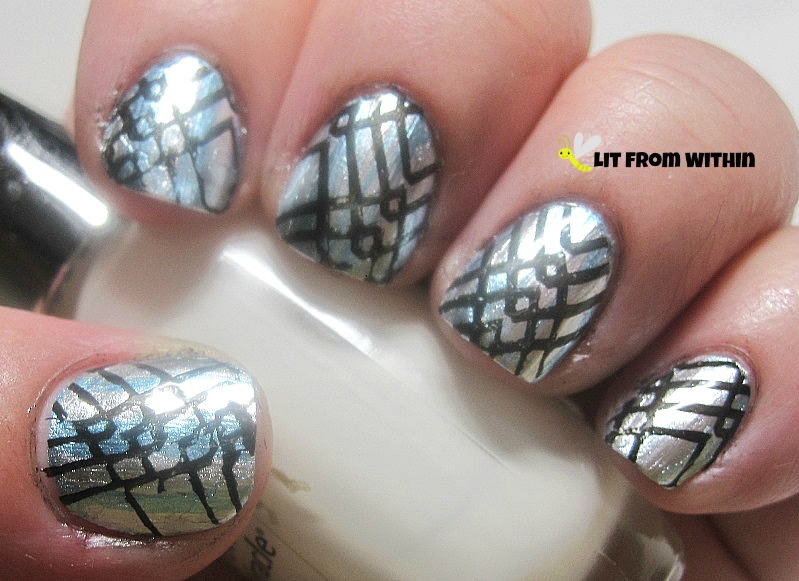 I thought it would be clever to take this Sisi & Cici08 stamp with this crosshatch pattern, and put it over stripes. You know, like diagonal lines in different directions over a vertical striped pattern? Crazy! I wasn't trying to line up the pattern, but I have to admit that I like the centered one on my ring finger a lot. Not only did these chromes reduce my camera to tears, but I couldn't seem to get a precise stamp, either. These polishes laughed in the face of anything trying to capture them. They just could not be contained or subdued. These chromes just want to let their freak flag fly. Both of the chromes came with their own special base coat, too, not pictured. SephoraX Glacier, Artic, and Cult Nails Nevermore. 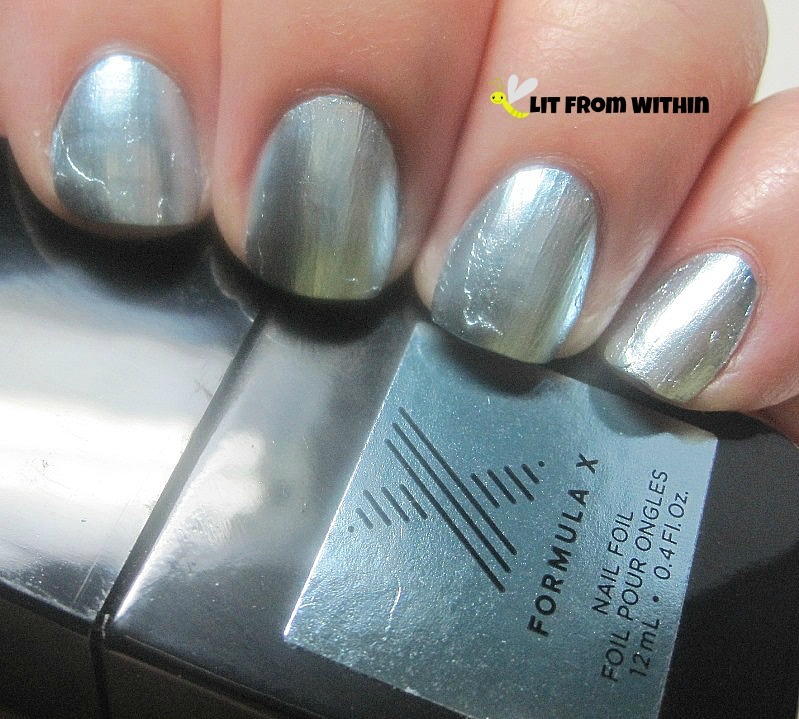 How do you feel about the resurgence of metallic chrome polishes for Fall? I'm so happy! 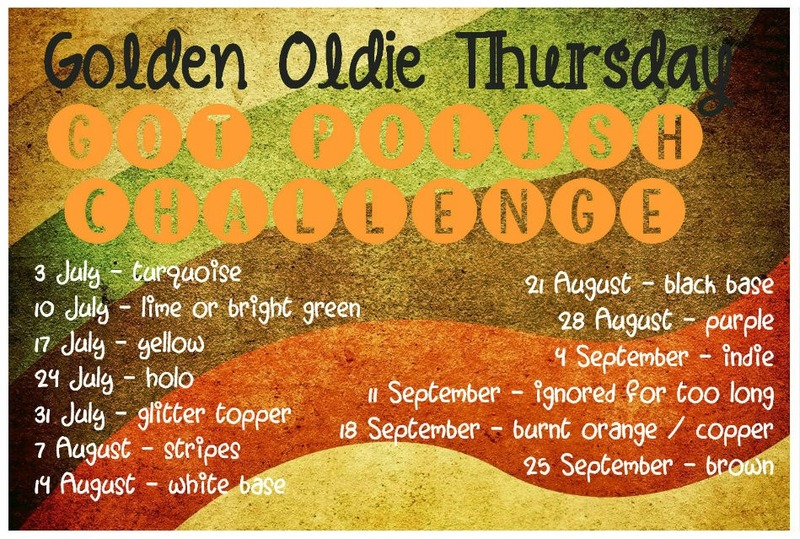 Two challenges today, and two posts! 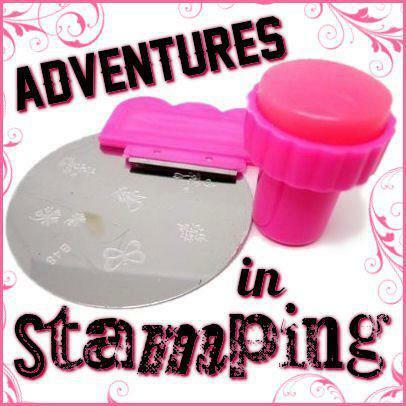 If you'd like to see my Adventures In Stamping stamping over stripes nailart, click HERE. 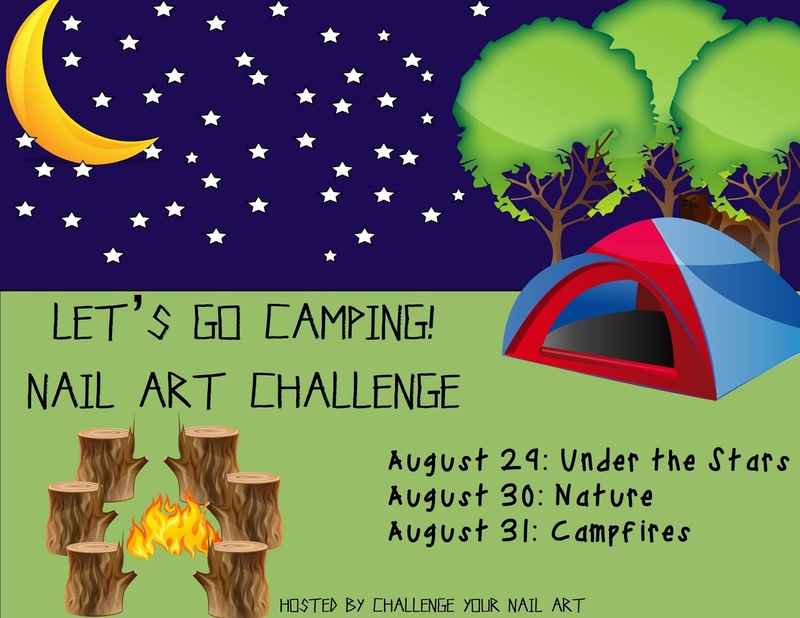 First up, the last of the Challenge Your Nail Art camping challenge - Campfires. I started with Zoya Jesy, a jelly coral-leaning-orange with lots of glitter. Forgot to get a pix by itself. Eh, there's lots of swatches of it online, though. 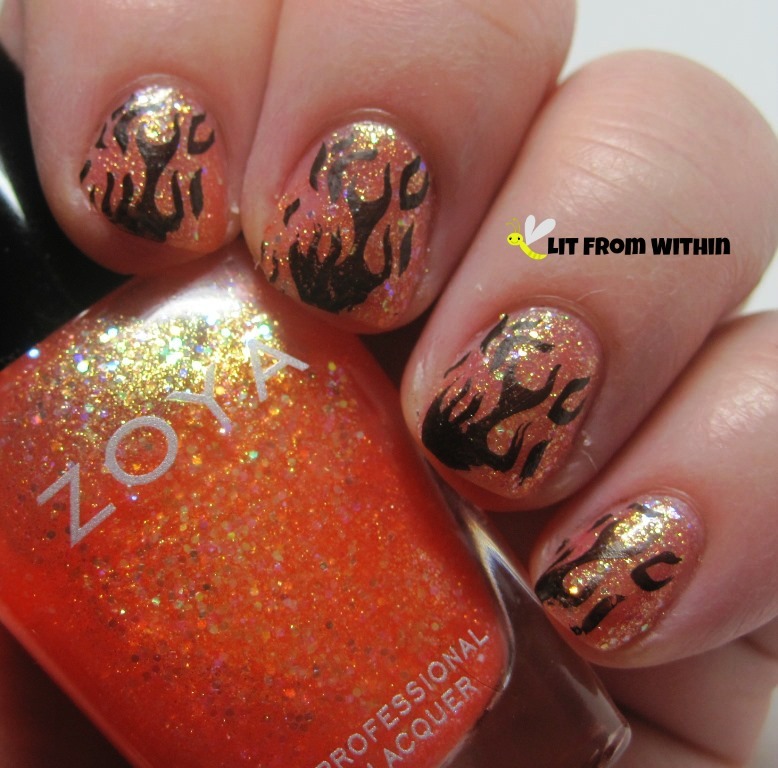 The whole Zoya Bubbly collection is pretty cool, but this was the one I *had* to have. Right away. 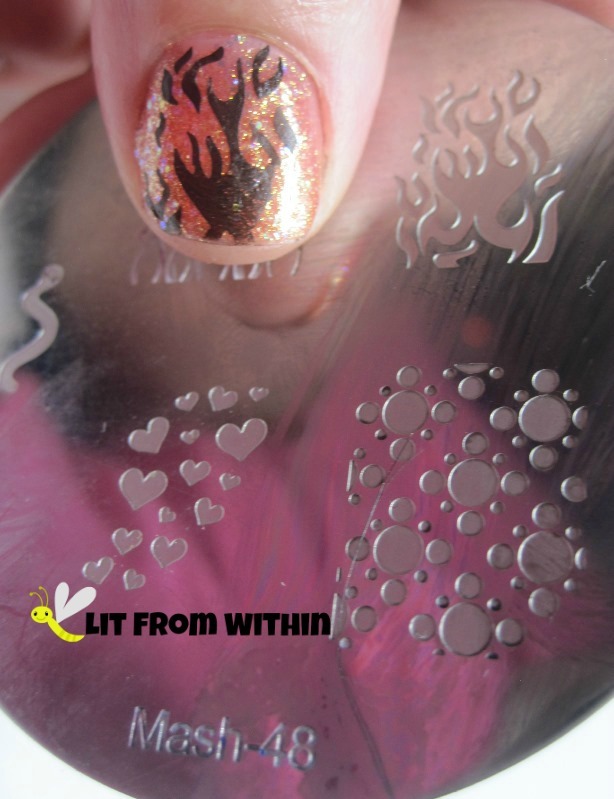 Then I stamped this cool fire with Wet 'n Wild Black Creme and the Mash 48 plate. Times like this, I wish I had longer nail beds, because I had to chop the bottom of the fire off. How cool is that stamp? I sponged a little Cirque Arcane Fire, because, fire. Yeah. I also painted in some 'logs' with Sally Hansen Salon Cinnamon, and used a white striper to detail it... and to also make marshmallows. What other reason is there to build a campfire, if not to roast marshmallows? I like them burnt. OMG. Drool. 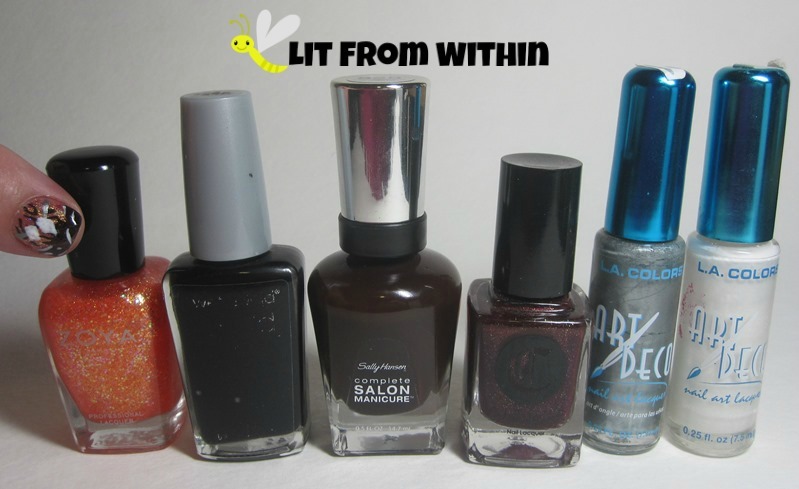 Bottle shot: Zoya Jesy, Wet 'n Wild Black Creme, Sally Hansen Salon Cinnamon, Cirque Arcane Fire, and stripers in silver and white. What's your favorite reason to have a campfire? If you saw yesterday's post, I mentioned how much I love nature... well, I love watching it from behind my sliding glass door. In the A/C. Last week, a dragonfly came into the house, and I swear it was 6 inches long. Dragonflies are so pretty and interesting.. but not in my house. It was huge, though, so I couldn't kill it and then have to wash bug guts up from all over, so the husband and I spent about 10 minutes shooing outside. Where it belonged. 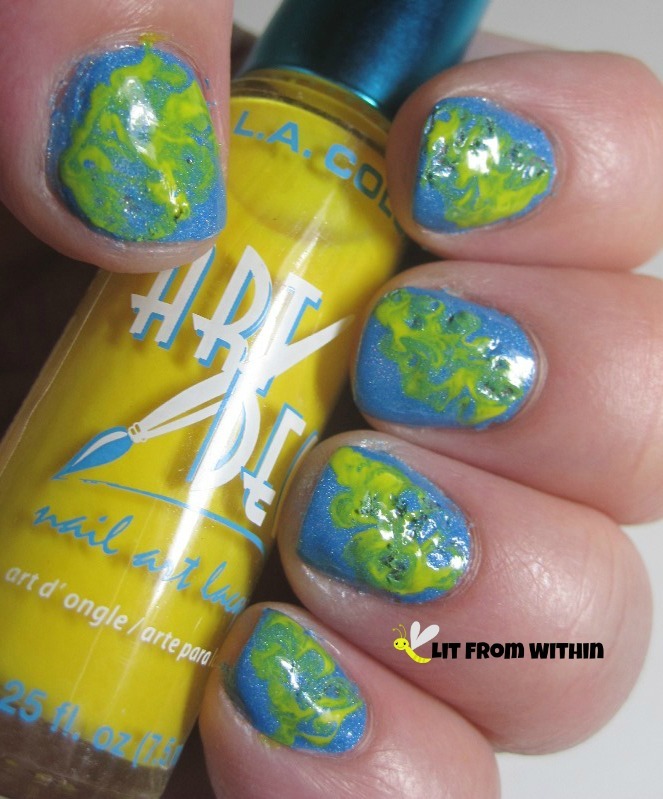 Now, you'd think that was a segue to a dragonfly mani, but no. 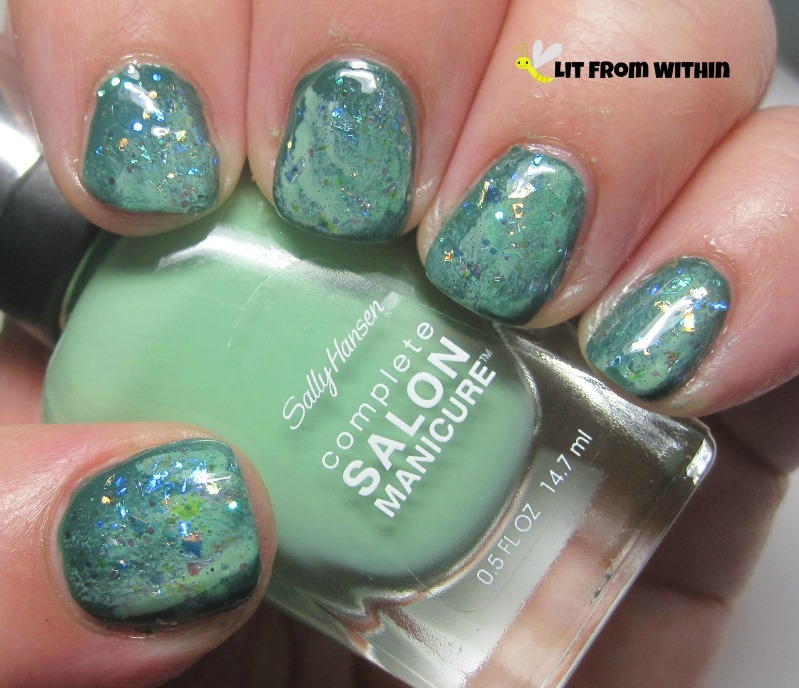 I took Sally Hansen Salon Mojito and sponged it over Green and Wear it, and then covered everything with a lovely flakie coat of Sally Hansen Triple Shine Pearly Whites. I was going for a sunlit-dappled forest canopy look. Sunlight flashing through the leaves like multi-colored flakies, you know? Or like the wings of a dragonfly, as seen through a glass door, while seated comfortably on the couch in the A/C, lovely beverage in hand. 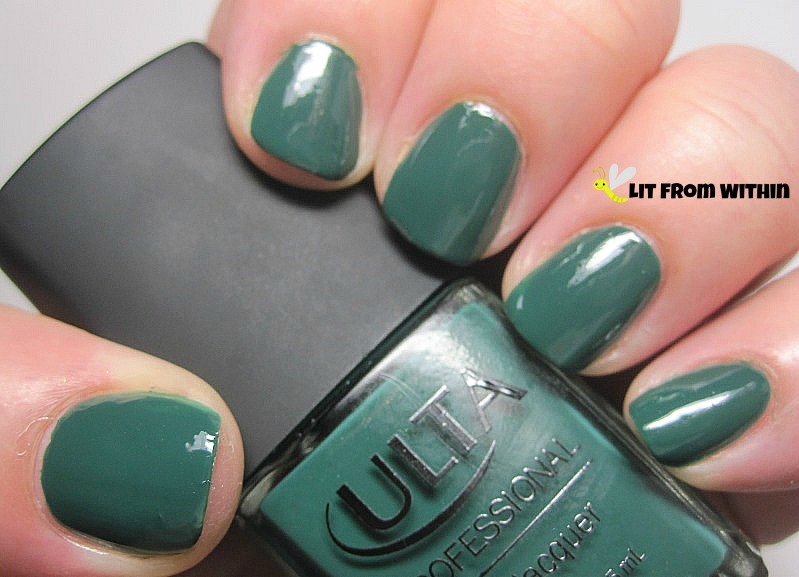 Bottle shot: Ulta Green And Wear It, Sally Hansen Salon Mojito, and Sally Hansen Triple Shine Pearly Whites. I also get the husband to relocate spiders, ladybugs, and butterflies, too, but any other bug inside is fair game for smushing. What do you do when nature intrudes inside? 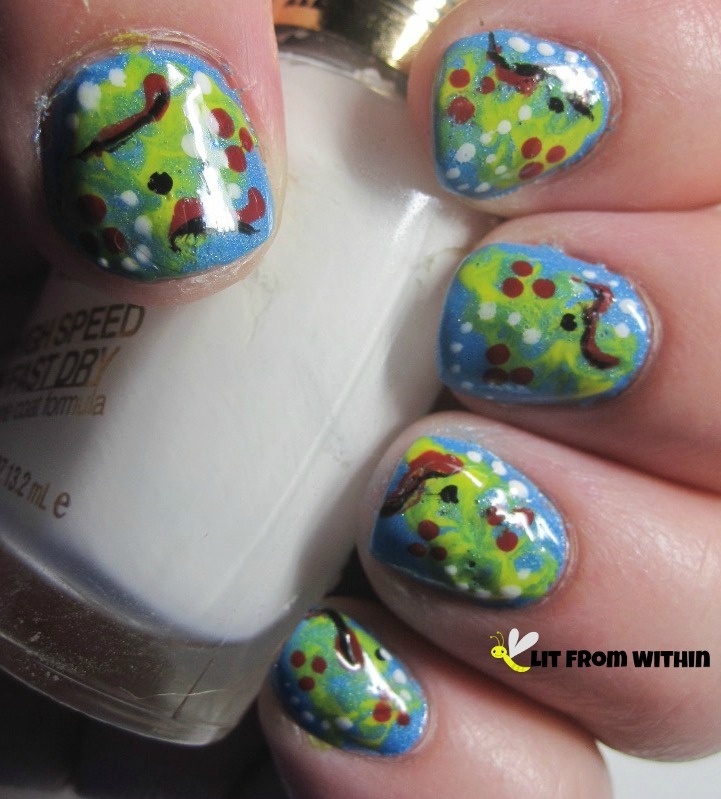 This month's Challenge Your Nail Art challenge is short and sweet - three days of camping-related manis. I've never been camping. I used to think I wanted to try camping, and then I remembered how much I hate mosquitoes, but how much they love me. Or that I like Western-style toilets. And A/C. And real showers. 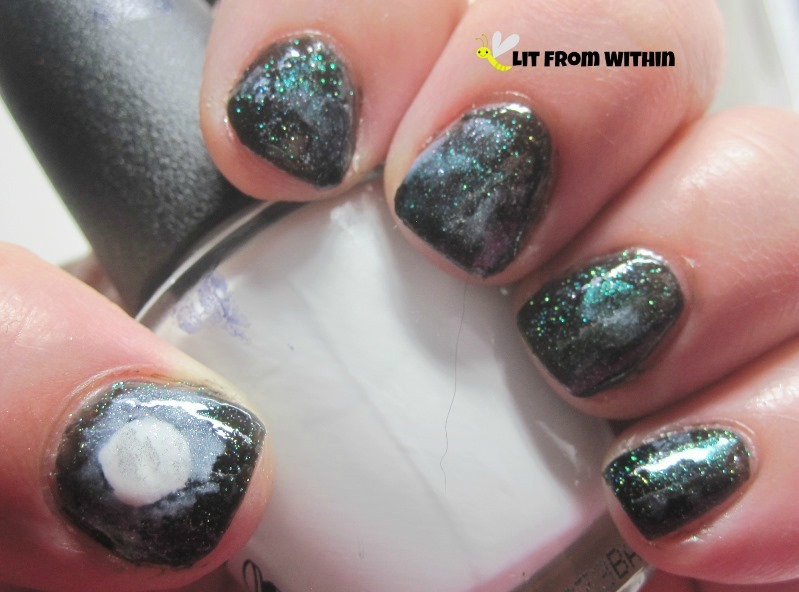 I do love the idea of a dark night with a bright moon and a mist of fog, so that's what I tried to depict on my nails. 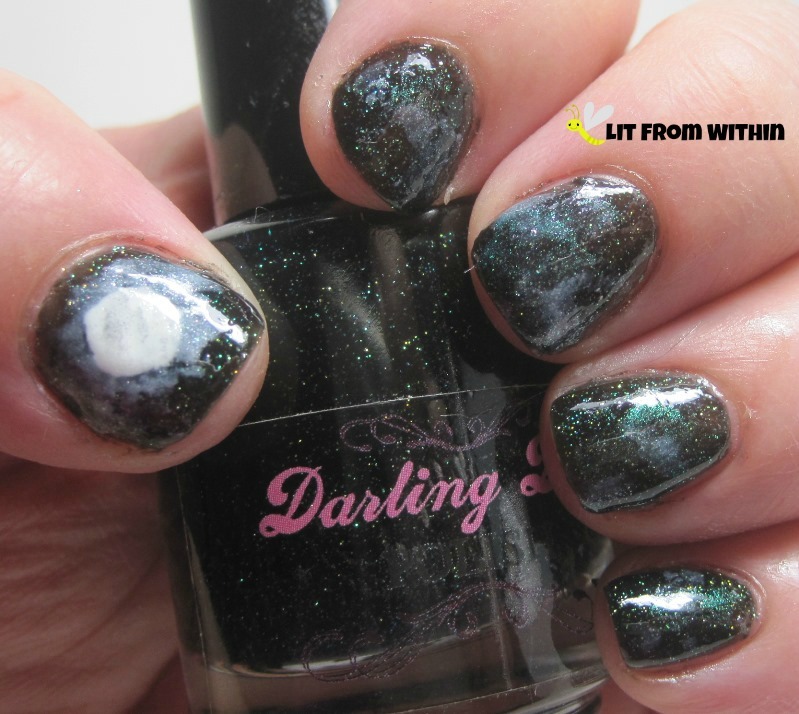 I started out with Darling Diva Polish What You Do For Money Honey, a dark green jelly with lots of gold shimmer. 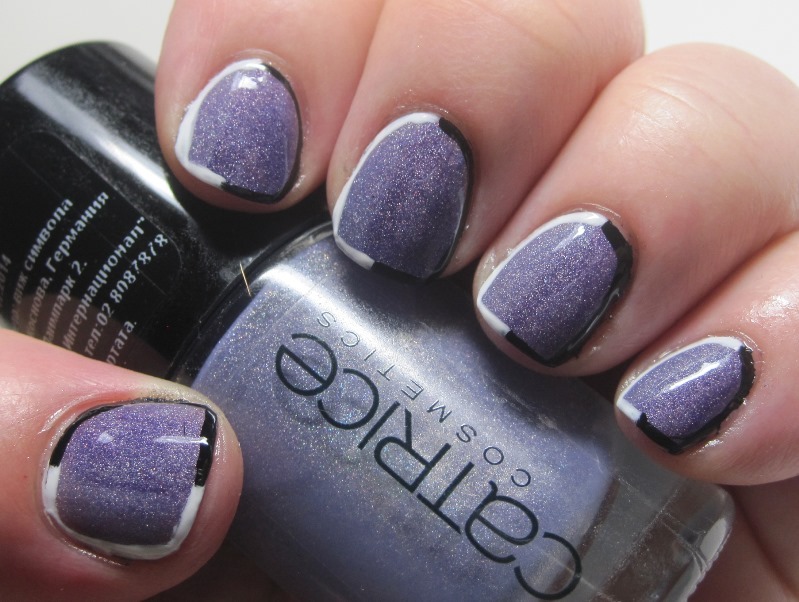 This jelly is a little tricky - took me 4 coats to get it opaque, and it never really dried. This one gets undies next time. 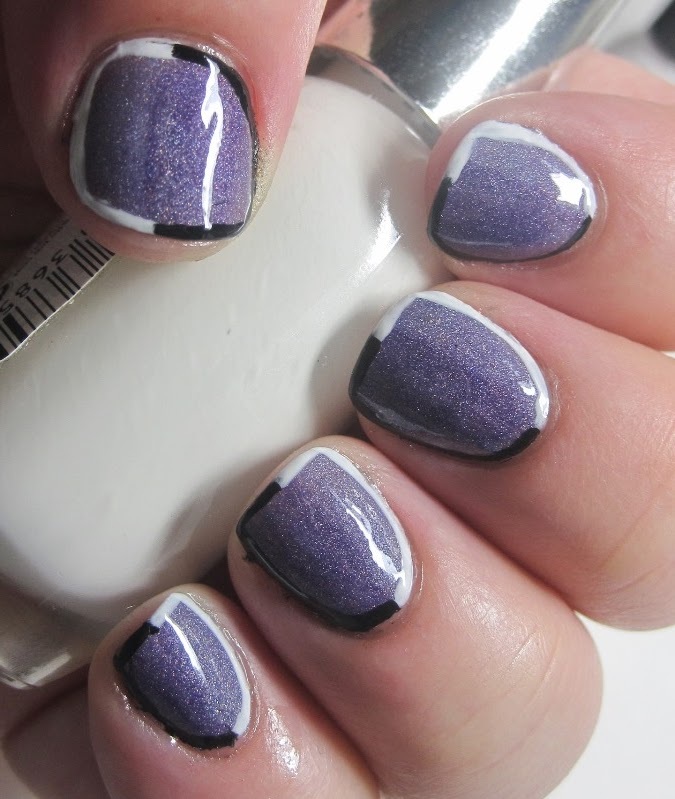 I painted a moon with OPI My Boyfriend Scales Walls with some shading of Dance Legend Grey Britain. For the mist, I dabbed on a little One Direction NaNaNa and Sally Hansen Triple Shine Great White. 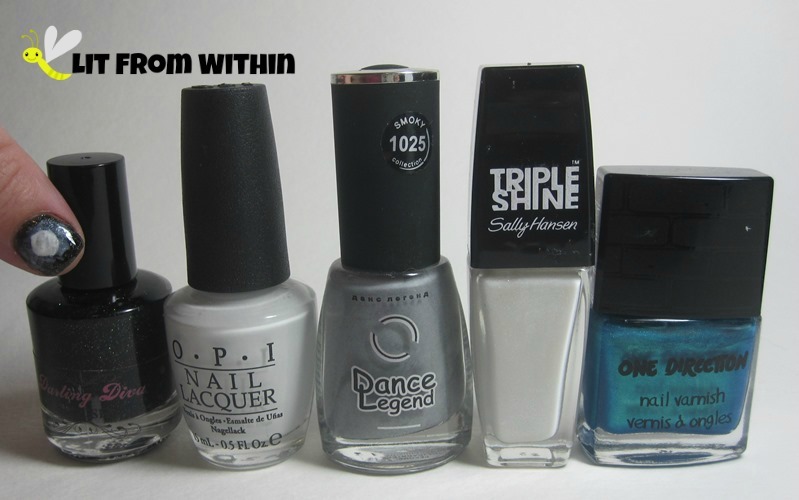 Bottle shot: Darling Diva Polish What You Do For Money Honey, OPI My Boyfriend Scales Walls, Dance Legend Grey Britain, Sally Hansen Triple Shine Great White, and One Direction NaNaNa. Sure, camping under the stars sounds romantic, but room service sounds nicer! Do you like camping under the stars? 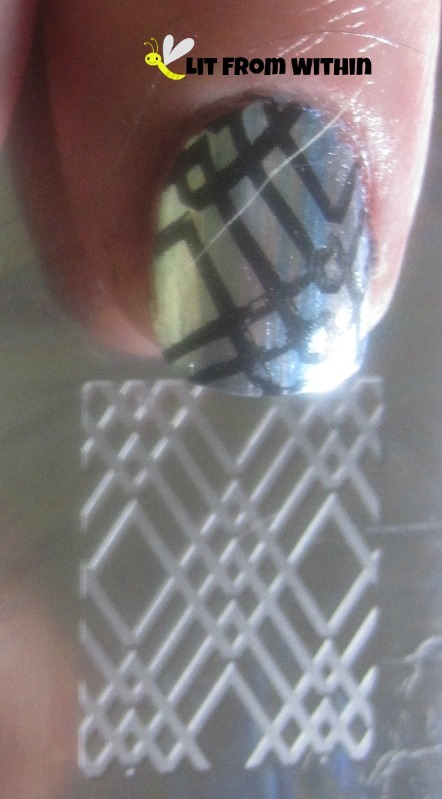 I took one look at this horizonal gradient framed nailart by @nadeekim and I knew I had to try something like it, too. I've never tried a horizontal gradient, and I loved the two-toned frame, too. 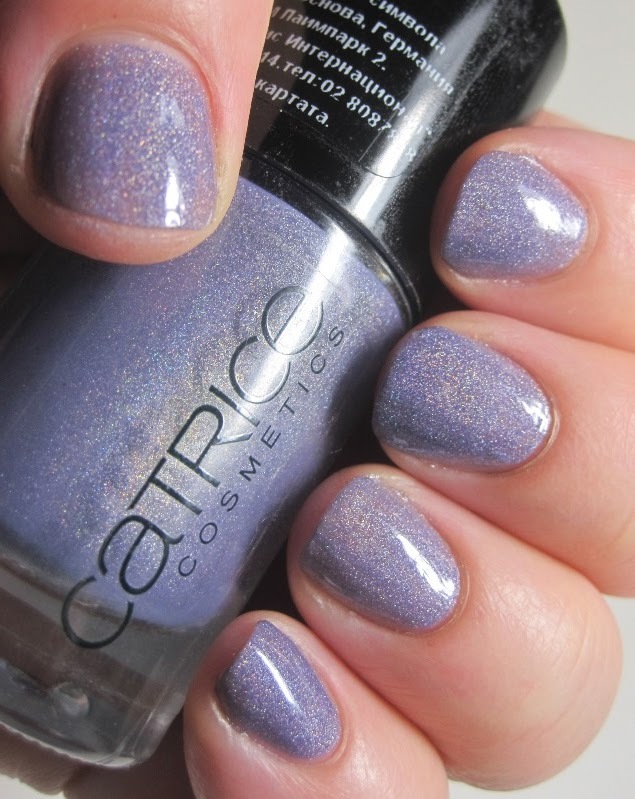 I started with a purple I knew needed some love - Catrice Dirty Berry. 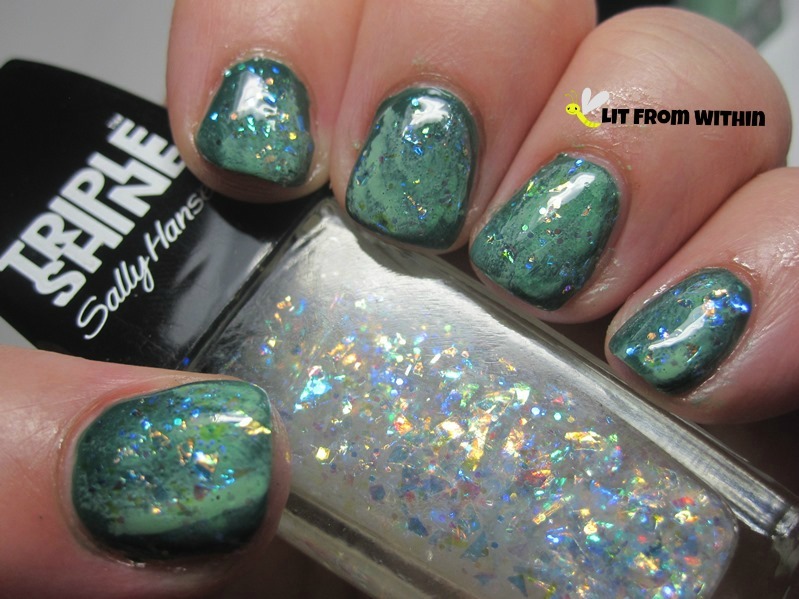 I lusted after this scattered holo, and scoured the internet for it! Pretty sure I got it from a Bulgarian web site. I was a little cray-cray, but it was totally worth it. I put some A-England Lady Of The Lake on the right side of the nails. Trust me, it looked darker in person. Framing half the nail with white and the other half in black also made the two sides look lighter and darker because of the optical illusion. So cool. I'm a freakin' nail magician, that's what. Lots of transitions here, so don't forget the topcoat to smooth everything out! You can maybe see the transitions clearer in this picture. Or, is it an illusion? A trick of the light? 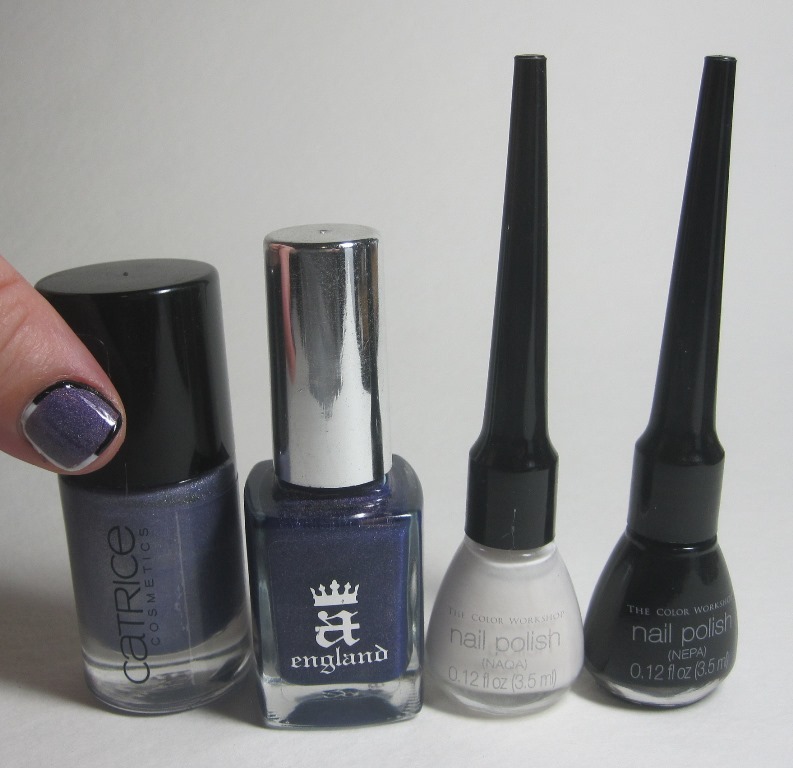 Bottle shot: Catrice Dirty Berry, A-England Lady Of The Lake, and stripers in white and black. 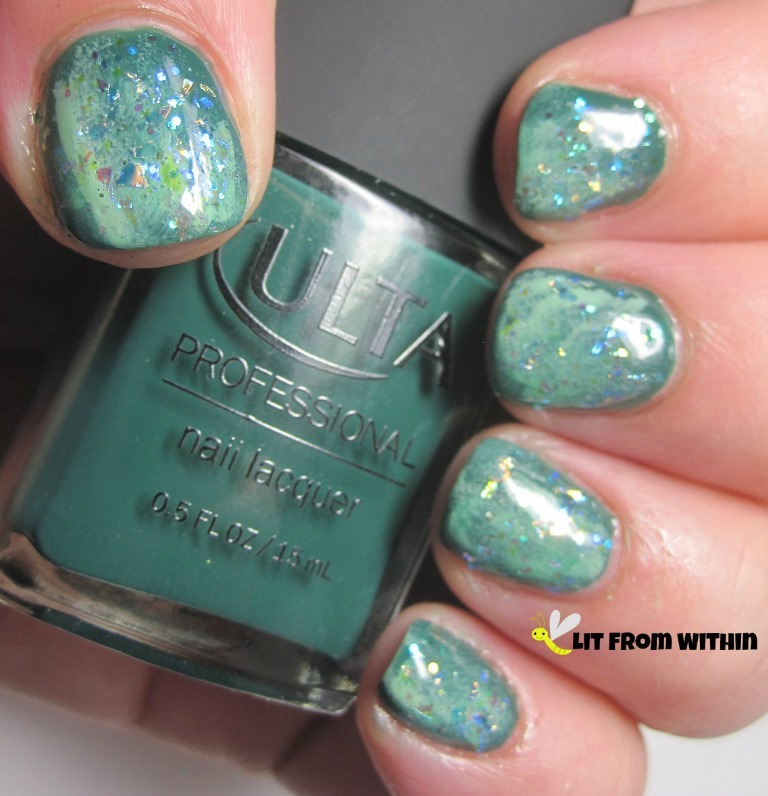 Does this make you see these two old polishes in a new light? 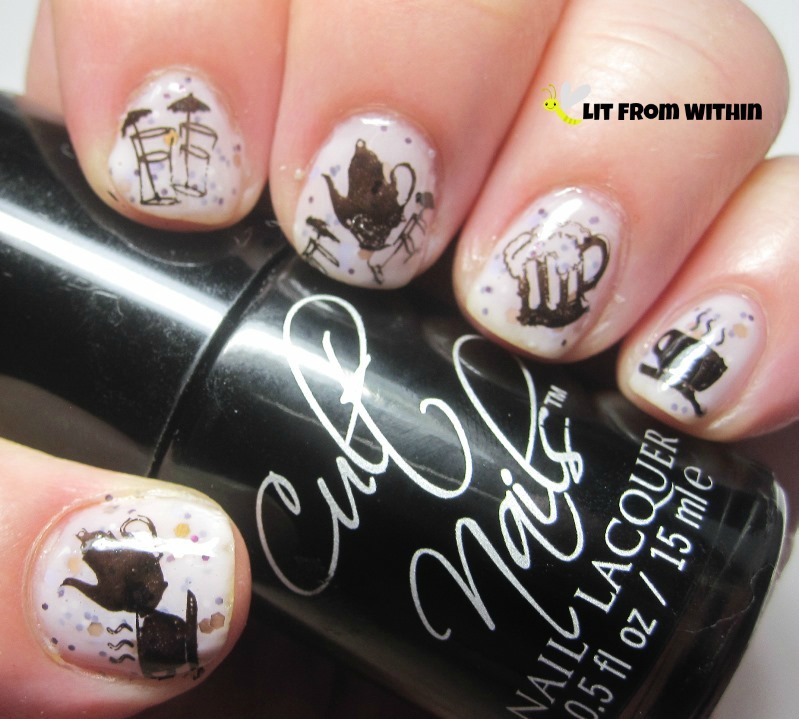 Time for the last tea party mani... and I don't know about you, but I can drink only so much tea. 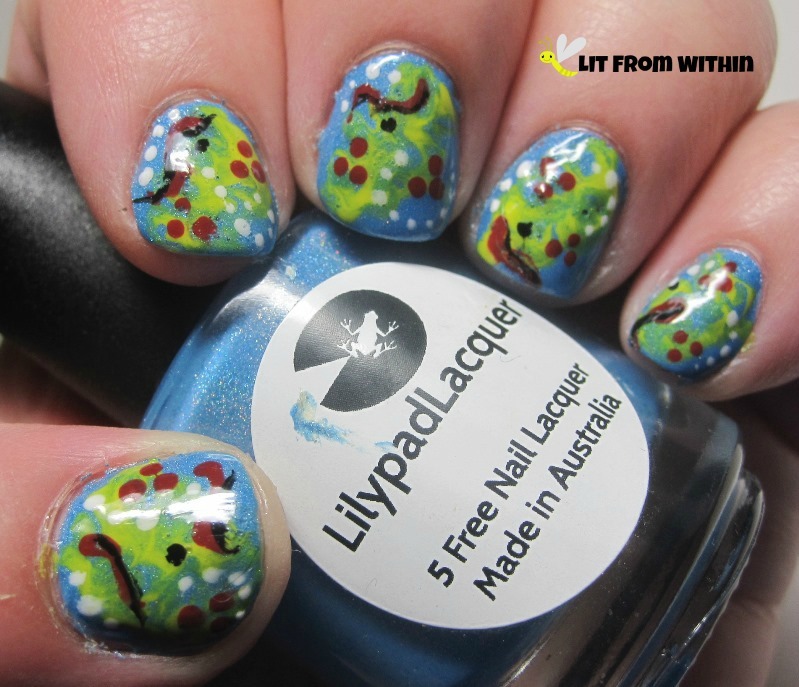 So, let's start the fun with a more festive background: Scofflaw Nail Varnish Cloud Cuckoo Land. Already sounding craaaazyyyy! 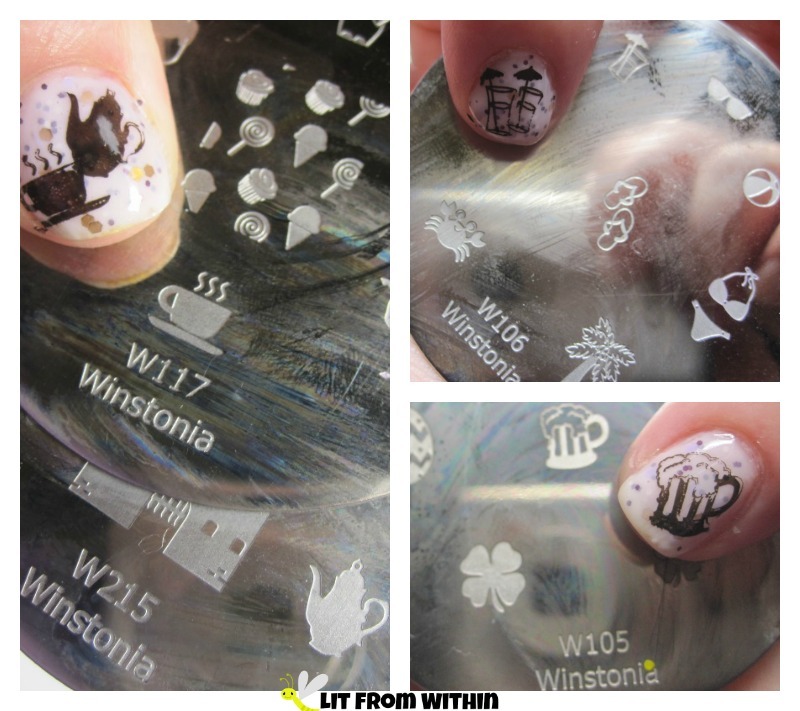 I scoured my collection of stamping plates for festive beverages to invite to the 'tea' party, and found some coffee, fruity cocktails, and frothy mugs o' beer! 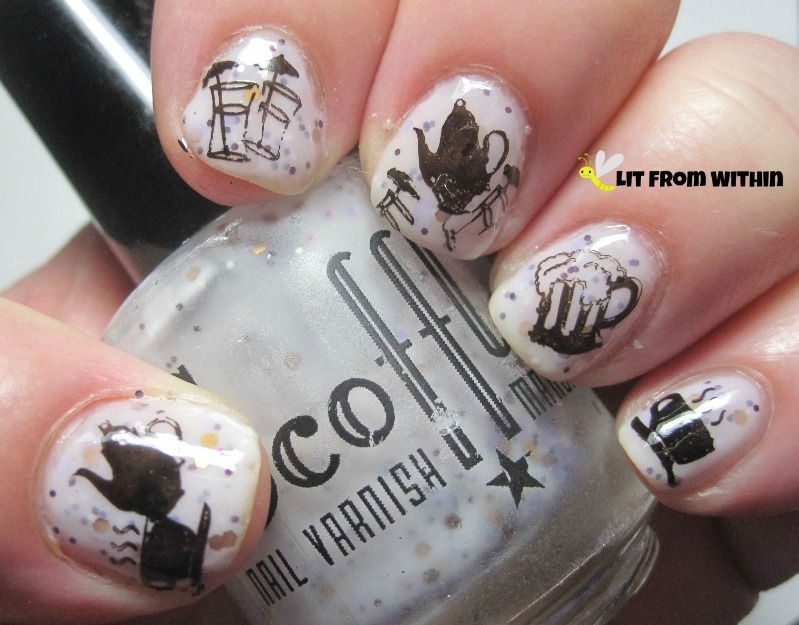 I may even be imagining that the coffee is spiked with Kahlua, or Baileys.. what do you spike tea with? Bourbon? For the kiddies, the umbrella drinks are just Shirley Temples, and the frothy mug is Butterbeer. Actually, I like Butterbeer. I'll have that. 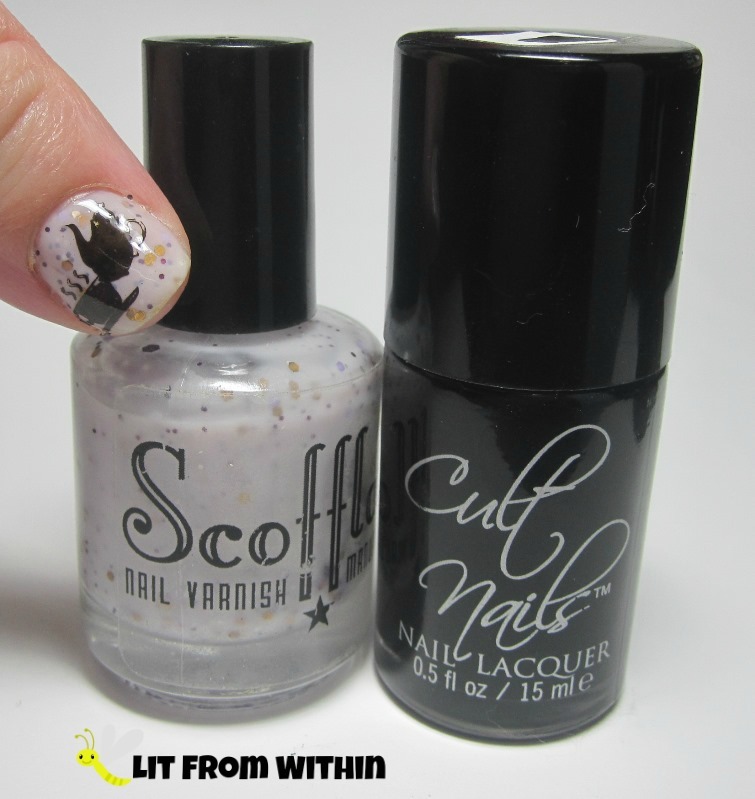 Bottle shot: Scofflaw Nail Varnish Cloud Cuckoo Land, and Cult Nails Nevermore. What would be your drink of choice to serve at a party? 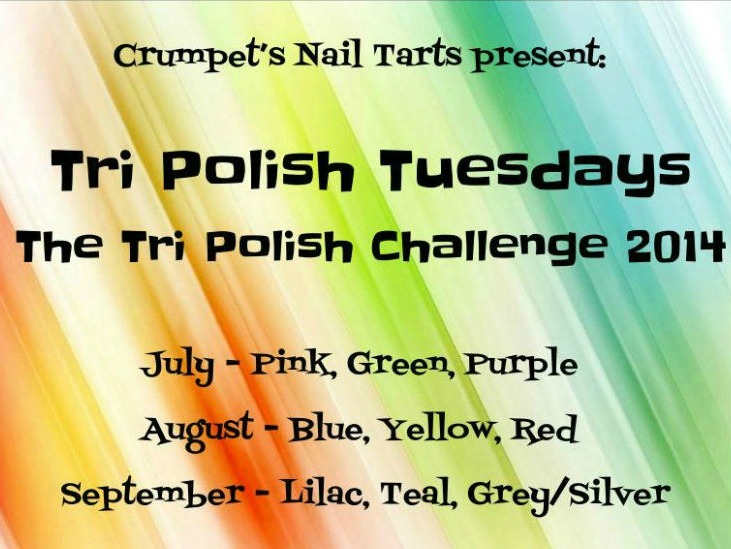 The end of another month, the end of another set of Tri-Polish challenges. 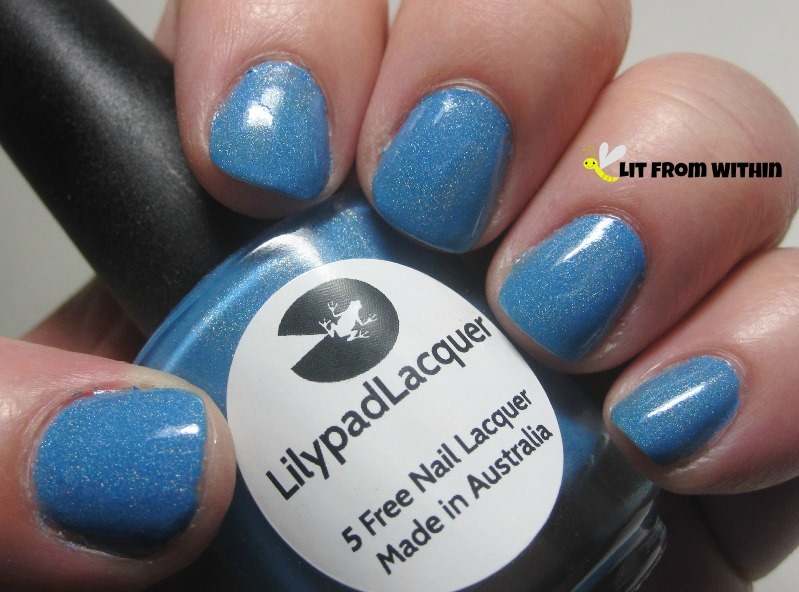 Let's finish this month with an awesome, awesome blue - Lilypad Lacquer Sherbet, said to be a dupe for Enchanted Water For Unicorns. I don't know for sure, because that's one I could never get my hands on. I'm happy with this, though, it's so beautiful, pigmented, and bright. What do you do with a mess? Slap on some more polish! 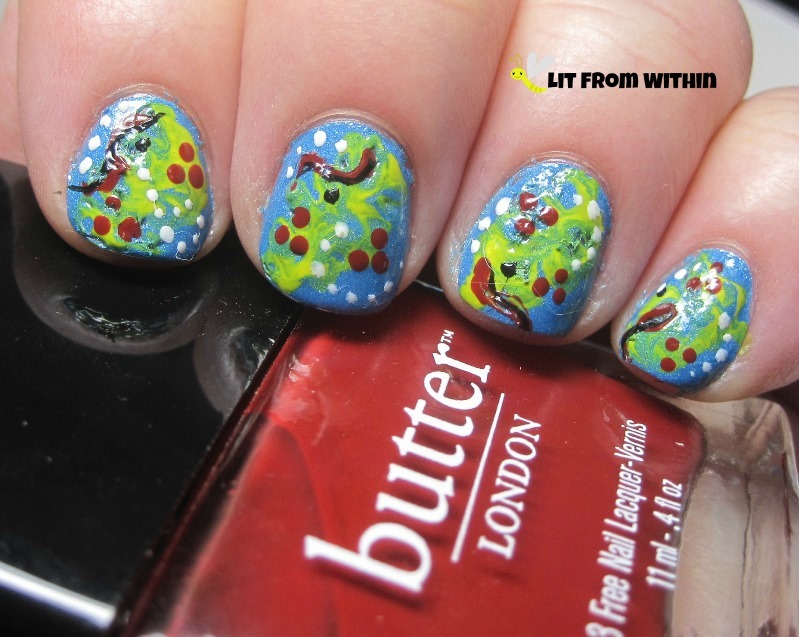 I added dots with Butter London Old Blighty, a creamy brick red, and my trusty white and black stripers. I think it looks kinda aquatic, with bubbles or something. Like I say, when it doubt, add dots. If it looks abstract enough, no one can tell you screwed up. 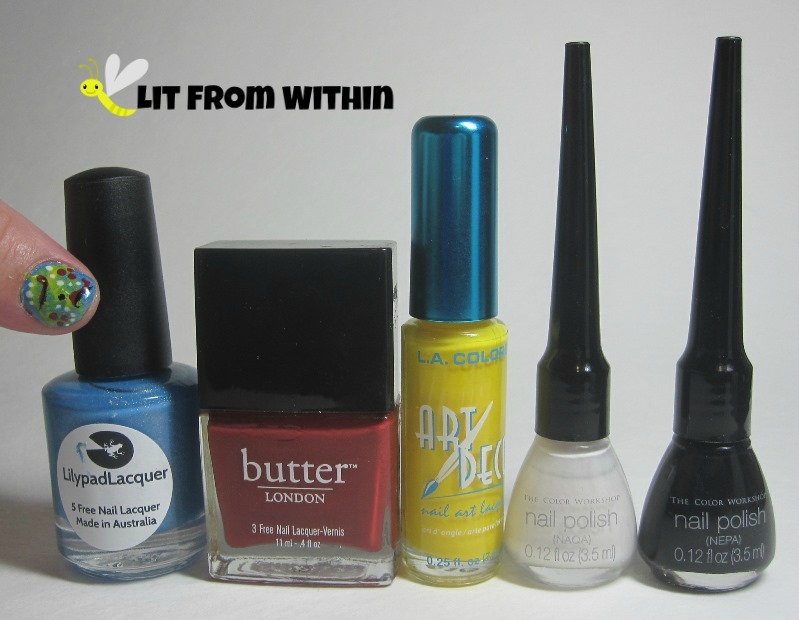 Bottle shot: Lilypad Lacquer Sherbet, Butter London Old Blighty, and nail art stripers in yellow, white, and black. Any helpful hints for doing marbled nails? I seem to be perpetually blocked with that technique! Is there some makeup or nail art technique you are just hopelessly fumbling with? Get ready to get greased up, 'cause we're talking OIL today. 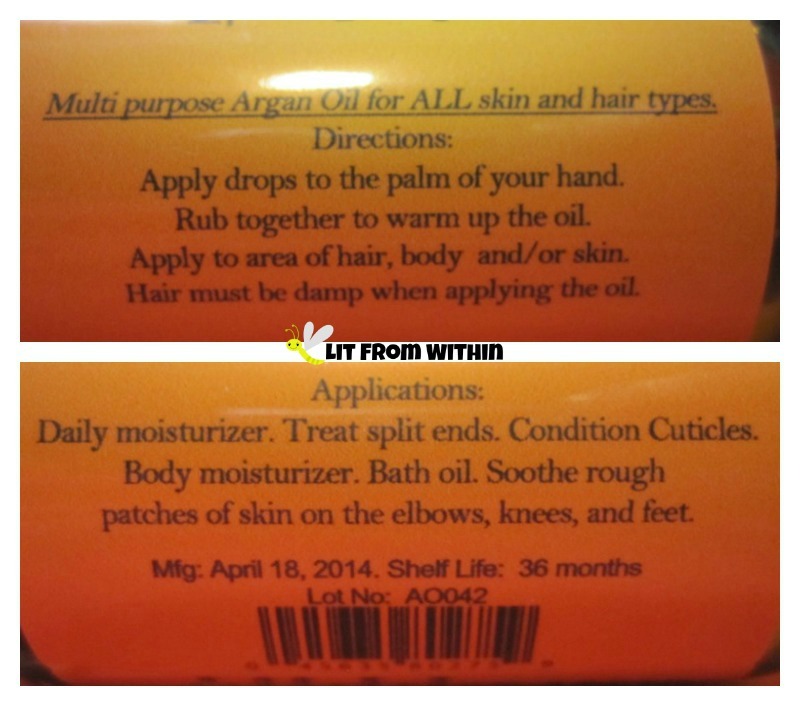 I love using oils in my skin and hair care, and one of the kings of oils these days is Argan oil. I was given the opportunity to try UNi 100% Organic Pure Moroccan Argan Oil, and I put it through its paces. I know I've been around the beauty block a few times, but I often feel like a newbie with all of the constant breakthroughs and plethora of products out there. So, I can really appreciate it when a product lists - right on the label - how the product is best used. Thanks, UNi, for telling me that your product works best on wet hair, and thanks for suggesting some common uses, and THANK YOU so much for including a shelf life, so I know when my product might be going bad. I wish all beauty products did this! 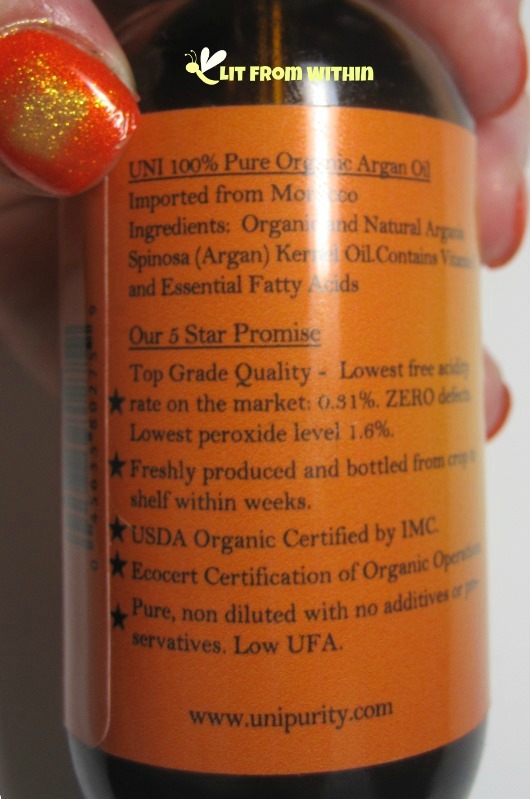 Even on this little bottle, they found room for all that info, plus the ingredients and their 5-Star Promise. To me, that's thinking about the customer. Application is easy with the dropper - though be careful, it doesn't always stay in the dropper! The oil itself is fairly clear, and with no discernible smell. As far as absorption rate, I find it's middle of the road for oils. Castor takes for-ever, and jojoba is fairly quick. As someone who changes their nail polish just about every day, I frequently use oil to keep my cuticles from drying out. This oil does that wonderfully. I also liked mixing a few drops of the oil with some hand lotion to make it easier to spread up my arms, on my rough elbows, and anywhere else! 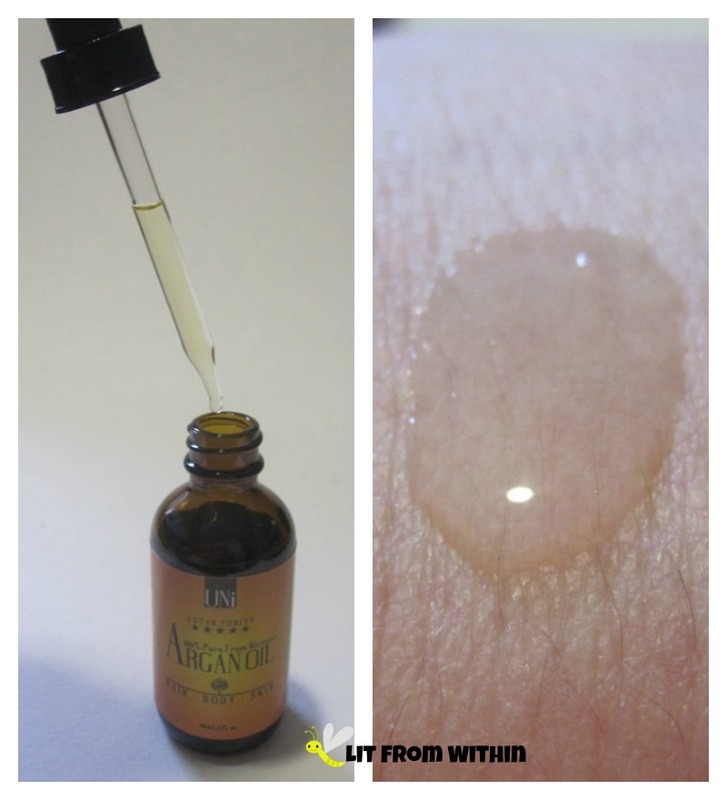 I also like making my own blends of oils, and argan oil plays a big part in those. I even used some of the UNi 100% Organic Pure Moroccan Argan Oil on my hair. My hair just sucked it up! But be careful, because it's easy to put too much on, and it can look greasy. The second time I applied it to wet hair, I stuck mostly to the ends, and that worked for me. 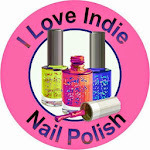 You know I love a product when I do a matching mani! I was inspired by the ombre yellow to orange effect on the label. 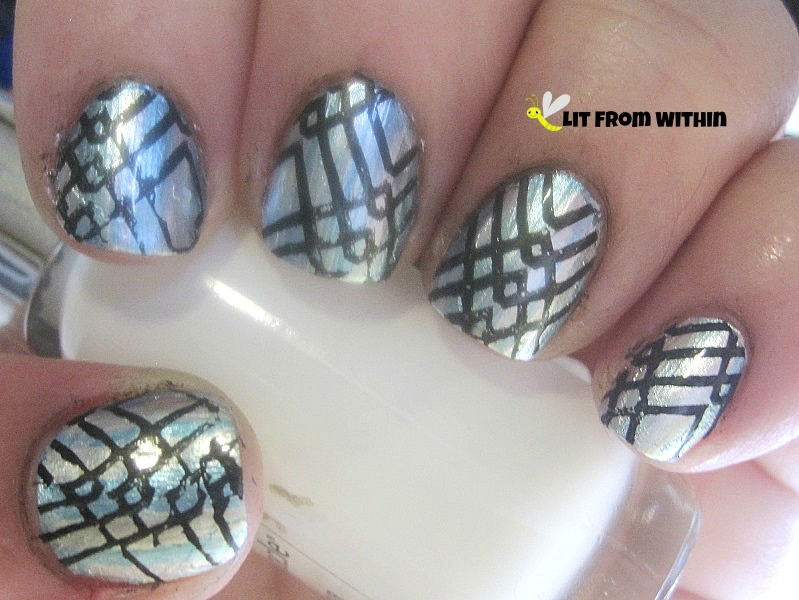 I used OPI Oy-Another Polish Joke and Sally Hansen Triple Shine Play Koi to mimic the effect. 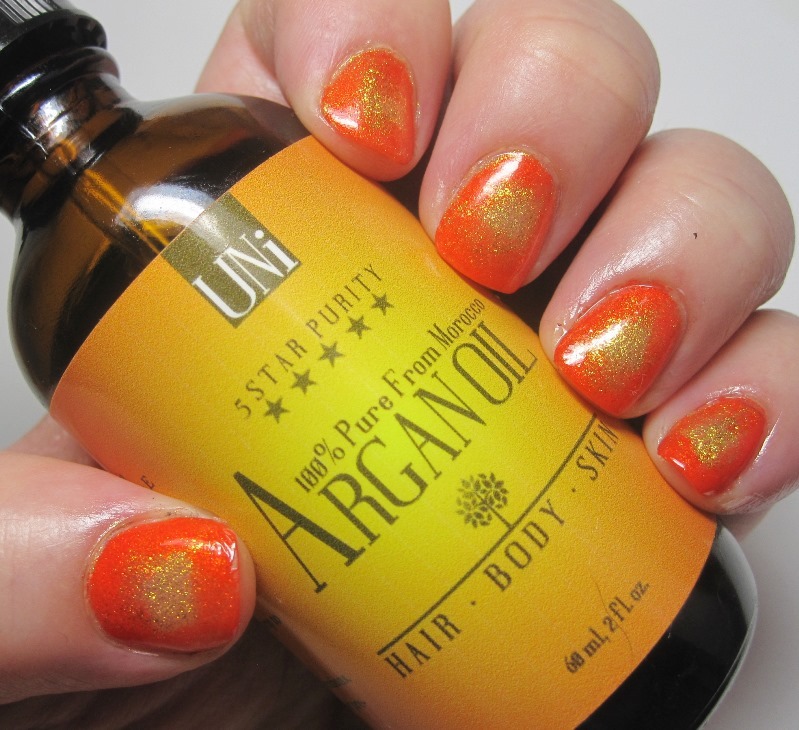 If you'd like more information about UNi 100% Organic Pure Moroccan Argan Oil, you can find them on Facebook, Amazon.com and their website.